SINGAPORE, April 12, 2014 - Tontowi Ahmad (R) and Liliyana Natsir of Indonesia compete during the mixed doubles semi-final match at the OUE Singapore Open badminton tournament against Liu Cheng and Bao Yixin of China in Singapore, April 12, 2014. 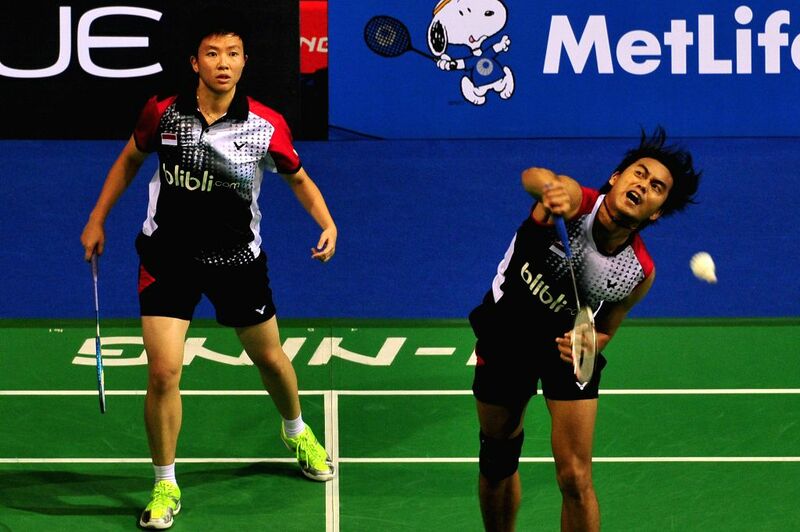 Tontowi Ahmad and Liliyana Natsir won 2-1. Liu Cheng (L) and Bao Yixin of China compete during the mixed doubles semifinal match at the OUE Singapore Open badminton tournament against Tontowi Ahmad and Liliyana Natsir of Indonesia in Singapore, April 12, 2014. Liu Cheng and Bao Yixin lost 1-2.